Here is another Asian inspired dish that I really liked. There was a lot of coconut milk sauce in this dish so I mixed it in with the cauliflower rice. Sooo yummy! Cauliflower rice is just cooked cauliflower grated in the food processor. You could also hand grate the cauliflower if you do not have a food processor. Enjoy! Add shrimp and cook for about 2-3 minutes. Add garlic powder and green curry paste; sauté one minute. 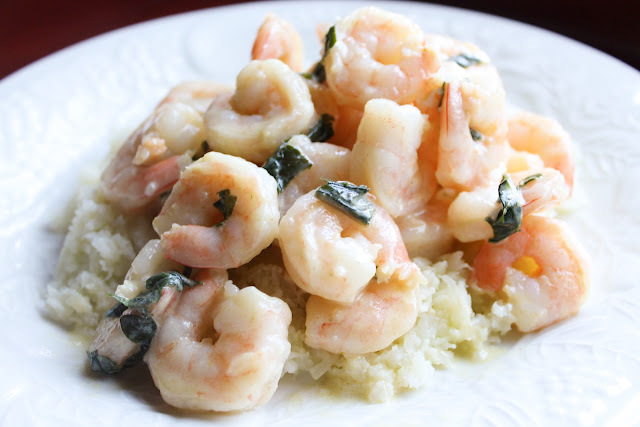 Mix well; simmer about 2-3 minutes, or until shrimp is cooked through. Remove from heat, mix in basil. Serve over cauli rice and enjoy!